This is Ling Ling, your guide, host and Toastmaster of the evening on 29th August, 2017. We had such a wonderful time that night! The meeting kicked off with an address by our lovely Sergeant at Arms, TM Awfa Nawawi. 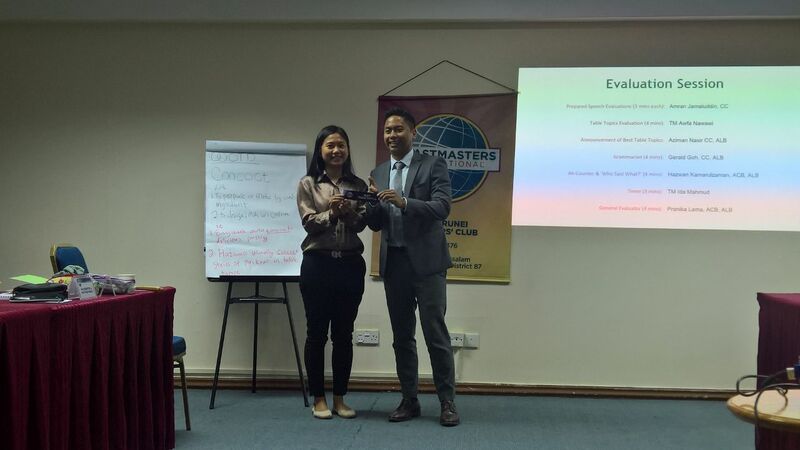 Her welcoming speech was warm and inviting, familiarizing our guests to what it is we do at Toastmasters. And we had so many new faces too! She then passed the floor to me, introducing me with much pomp and grandeur. At first, I was nervous and fumbled a few times, but the audience was so encouraging and supportive that I soon let go of my fear. I was especially proud at the dramatic way my Quote of the Day was delivered. 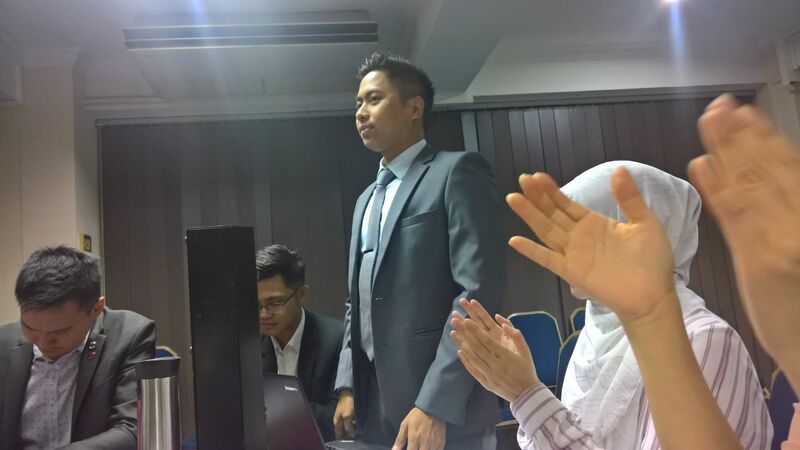 I presented my role players with the deference they deserve, starting with our Table Topics Master, Competent Communicator and Advanced Leader Bronze, Aziman Nasir. He had a theme prepared (“Conversation Starters”) and everyone looked intrigued to try the Table Topics after he announced it. Then, Awfa returned to the stage as our Table Topics Evaluator. The week before, she had confided in me she was not as familiar with the evaluator position as she is with the other roles, but she was keen to improve herself and that was why she took it on. 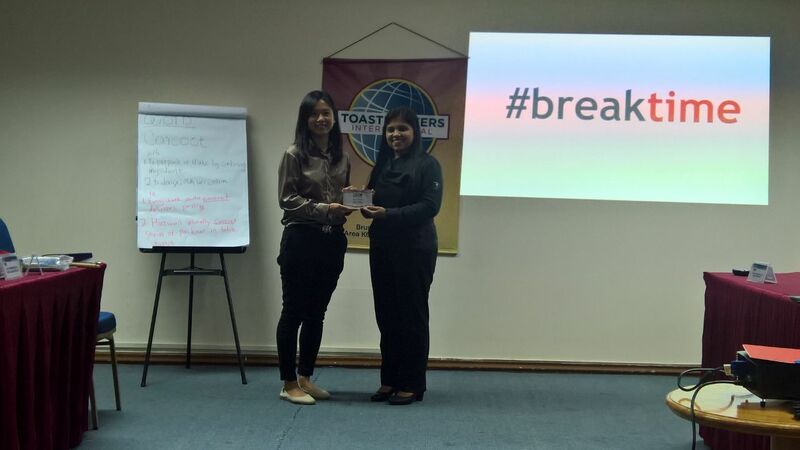 I was humbled by her determination to better herself and I thought that really captured the spirit of what Toastmasters is all about. After Awfa, our Grammarian, Competent Communicator and Advanced Leader Bronze, Gerald Goh, took the stage with much eloquence and articulation. He revealed the Word of the Day, “Concoct”, which I thought was perfect, as our Brunei Speakers Club is very much a concoction of folks from different walks of life. Following Gerald was Advanced Leader Bronze and Advanced Leader Bronze, Hazwan Kamarulzaman. He had been hard at work taking on evaluation roles in preparation for the upcoming Contests and the Ah Counter was another opportunity to train. I daresay his drive and initiative inspired quite a few members, including me! Next, our lovely TM Masridah (Ida) Mahmud was introduced as the Timer & Tip of the evening. She had just joined our club the week before and was very keen on getting everything just right. She was even one of the very first to arrive at the meeting! Now that’s commitment to the task! 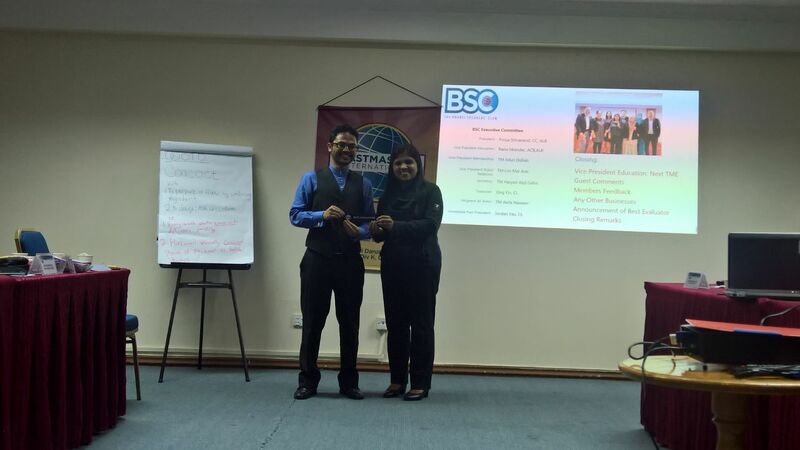 To round out the team, we had a member from our sister club, the UBD TMC, Advanced Leader Bronze and Advance Leader Bronze, Pranika Lama, as our General Evaluator. She is very much the seasoned pro and I cannot think of a better person to push us to be better speakers and leaders. In the wake of this awesome cast and crew, everyone was fired up for the first speech of the evening by Competent Leader Jordan Yau. 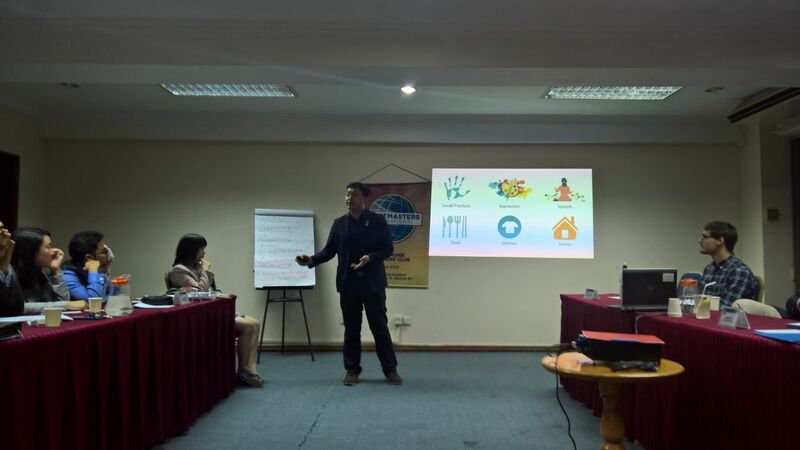 His speech evaluator, Competent Communicator, Amran Jamaluddin, explained that Jordan was doing his CC8: Get Comfortable with Visual Aids, which meant he had to engage the audience with some eye candy. Jordan got right to it with help from the projector, going through slide after vibrant slide. His speech, A Man of Culture, demonstrated how while we all might come from different backgrounds and vocations, we are all united under one common banner: Pop Culture. Taking over from Jordan was President and reigning District Champion, Competent Communicator and Advanced Leader Bronze, Pooja Shivanand. We were so thrilled to have her present a workshop on Effective Evaluation. Her speech covered the preparation, structure and delivery of evaluations as well as reinforcing the reason why we do what we do. Her workshop gave members an understanding of how one might tackle an evaluation as well as rekindled a fire for the contest that was coming up. After that flurry of note taking, we had a lovely break where we mingled and got to know each other a bit better while gorging on puffs and tarts from our Sergeant at Arms. Next was the fun of the evening, the Table Topics! Aziman took the stage and called upon TM Suneeta Pathak first. Her topic was on how she gets rid of stress and she explains that she gets by with a little help from her family and friends. TM Heidi Rahman was asked what was her favourite way to waste time was and she was scandalised because her days are so full and she barely has time for herself. Guest Fizah was next and she had to choose between being very active or just relaxing when she has the time. She said that although she lives a very active lifestyle, her preference is just to do nothing during her free time. Last was TM Lim Mei Ann and she was asked what were her goals for the next two years. She delivered a moving speech on how she would learn Chinese to better communicate with her parents which touched everyone - enough to vote her as the 'Best Table Topics' of the night! Finally, it was time for Evaluations! Pranika took over and led an enriching and educational session. Amran started the ball rolling with an insightful analysis of Jordan’s speech, utilising the things he learned from Pooja’s workshop almost immediately. Next was Awfa who lent a warm and gentle touch to the rigours of speech evaluations. Gerald went after and gave so many good examples of English that everyone felt a little more confident in their language skills. Following him was Hazwan who went for a qualitative approach and drew attention to the techniques that was used and could have been used by the members. Later, Ida came forward with her Timer report and it was so well done that no one would have known she was new at it. Lastly, Pranika came forward to wrap it up and said what we were all thinking: that the meeting had the perfect balance of (what I like to call) “edu-tainment” and it was only due to the continuous efforts of our members that it can be this way. At the end of the meeting, our President had the floor again and echoed that sentiment. It is heart-warming to see how our members assist and support each other to strive to be better. I have to say that I agree with that whole heartedly! The meeting could only be so successful because everyone worked together and had a hand in helping things along. Here’s to hoping every meeting will be like this – or better! P.S. Oh and by the way, Hazwan won Best Evaluator again. The guy must have quite a collection of ribbons by now.